This entry was posted on Tuesday, March 19th, 2019 at 5:00 AM and is filed under City government. You can follow any responses to this entry through the RSS 2.0 feed. You can leave a response, or trackback from your own site. Everyone screaming about “socialism…” This is simply taking money from the lowly taxpayers, without asking them for approval, and funneling it to “businesses” of council’s choice (or maybe T-Rex has contacts there? ?…just like we are giving millions to Great Wolf to beg them to build a cheap “resort” here. What ever happened to the idea in capitalism that businesses took risks in order to create profit? The truly sickening aspect of all this is that there is simply no way to force Council, Mayor and Manager to STOP. Precisely. The $400,000 gift to the cyclists is only one percent of the $40 million that we are going to end up gifting to Great Wolf. That is in addition to several million dollars worth of taxpayer-owned land they get to buy for about $20,000. I cannot believe a half million for this. We had our own local race a few years back that was discontinued. This is an outrage. The city should not be subsidizing races. It is not a race and we still shouldn’t be spending money in this. This is a taxpayer subsidy for downtown hotels that have already been given big tax breaks. The El Taxo politicians, Criminal Empire, never tire of taking money from US. THEY can always increase OUR taxes and take MORE. Inherent corruption, El Taxo. What is the point of these events if we have to subsidize them so heavily? All we will ever get are events that require heavy subsidies now that everyone knows city council will give out taxpayer dollars to anyone that asks. Our city clowncil is proving day after day that they should be wearing Walgreens red noses throughout the year. Just more lie, deny, deceive, waste, tax, spend, waste some more. The Empire of CORRUPTION is going to FORCE taxpayers, working people in El Taxo, to PAY people to learn HOW to ride bicycles. These politicians, Public “Officials” are a bigger JOKE, than their original brain farts to create bicycle lanes all over El Taxo and make traffic even worse than it already was, is. Idiocy at it’s worst. I’d say that some guy in SoCal knows just how to stroke elected reps in El Chuco. And from their website, it appears that this is just a two day conference at the convention center that will host speakers and do some testing on attendees. This also appears to be a startup organized by a SoCal marketing guy who lists a lot of folks on his website but doesn’t appear to have traditional job titles outside of a marketing team. Normally conference organizers pay a city for use of a convention center, not the other way around. It appears we have been seduced by a company needing money to host an event. 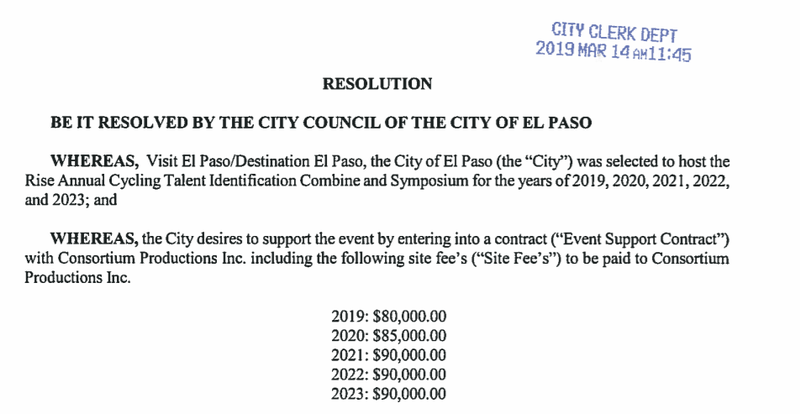 Given that there appears to be no ”local” connection to EP, my guess is our site was selected because we were the only ones willing to pay for an event with no historical attendance numbers. It will be interesting to see how cyclists attending the event appreciate our dry heat in June. Not the best month to lock folks in for a longer EP vacation. lf l don’t understand this, l hope you’ll cut me some slack because l just woke up and and you’re hitting me with this tidal wave of illogic. So we’re going to pay a company which will train people to feel good about themselves when they jump on their bicycles, and eventually this will cause at least one of our own to win the Tour de France which will somehow benefit the rest of us 915ers. This is truly El Paso.